Washing my brush every single day???? HECK NO..!!!! I can't imagine how much time I need to dedicate every single day for that. The make up industry in the other hand is very "nicely understanding". To solve the laziness problem of cleaning the make up brush every single day, some company create make up brush cleaner that is just so easy to use everyday. With just a spray, the residues and bacteria sticking in your make up brush will disappear in a click instant. Such a useful product right? There is only one problem in those product. Their price! It is soooo expensive. Heck no.. I'm not going to spend too much money just to clean my brush. What I remember, it uses 2 main ingredients. Alcohol and face cleanser. So here are my version of making my own make up brush cleaner. 1. Face cleanser: This will remove the residues sticking in your dirty brush more easily. I recommend using the all in one face liquid cleanser. Please use the NON OIL BASED face cleanser. 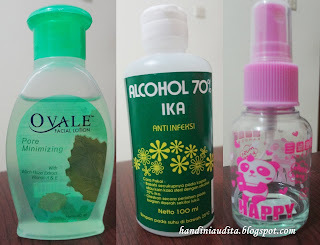 In Indonesia, the brand I recommend to use is Ovale. However, you are free to use any brand of face cleanser according to your preferences. 2. Alcohol : This will make your brush dry quicker. Plus, it kills the bacteria that sticks in your dirty brush. The 70% of alcohol formula is enough for this. 3. Spray bottle: This will make the application more easier. 1. Prepare your clean spray bottle. Fill half of it with face cleanser, and the other half with alcohol. 2. Close the lid. Spray it to a clean tissue until it is well wet. 3. Rub your dirty brush back and forth until it is clean. 4. Look at those dirty residues transferring to the tissue. Can you imagine if those residues transfers to our skin instead? So ladies, it is that simple and that cheap to make your own brush cleanser. Now there is no more excuse not to clean your dirty brushes. Make sure you clean before use. And don't forget to deep clean at least every 2 weeks. Even though you already clean your brush everyday with this brush cleanser, it does not mean you can stop deep cleansing your brush. Deep cleansing is still very important since it will take away all the bad residues that are not taken away with instant cleansing. links or maybe guest authoring a blog post or vice-versa? you! Wonderful blog by the way! If you're like me, you're proud of your collection of makeup brush cleaner. I have quite a few made from all kinds of different animal hair, synthetics, you name it. Problem is, I like to use really colorful makeup. In particular, I like to use many different colors that would all smudge into some horrid brown after a few days of mixing on my brushes.